When I finally became a mum, I thought life would become a slightly more realistic version of the Disney dream! I thought it would be very enjoyable; we would continuously feel loving towards each other, deeply enjoy being together and the birth of our first born would enlighten our lives entirely. What a shock reality was! I became the mum of a newborn daughter who didn’t want to be touched. My shock, sadness, doubt and guilt were overwhelming. Was it me? Didn’t I love her the right way? Had my upbringing damaged my ability to love her enough and connect with her properly? How would I ever know if I loved her enough? Had my daughter felt my doubts about my ability to mother when she was in uterus? Had the pain of my illness affected her so badly she wasn’t able to love? Had I already messed her up for life? Would she ever be able to have a fulfilling life if I wasn’t able to give her a good start? The questions ran through my head constantly. Our baby daughter slept less than we did, and woke us every one and half hours screaming her head off. She didn’t play at all, was only interested in communicating, and was physically and verbally very frustrated and angry when I didn’t understand what she was trying to get across. She was very clumsy and wasn’t able to hold anything in her hands as was developmentally expected. Everybody I spoke with thought there was something really worrisome going on. “She should sleep more!” they said, and questioned what I was doing that kept her from sleeping or that made her so frustrated. The opinions wavered between extremes. I shouldn’t breastfeed her on demand or I should breastfeed her more on demand. I should let her scream at night and let her fall asleep on her own or not leave her on her own any moment of the day. Of course, the comments, and the non-verbal clues, in my social environment triggered in me many unhelpful thoughts. What was I doing wrong? Why couldn’t I get her to sleep longer? How would she ever be able to function in life if she didn’t sleep enough? How was I ever again going to function properly in life if I didn’t sleep enough? I knew nothing about Sensual OE, which affected her, or Emotional OE, which affected me at the time. I knew nothing about the Cycle of Emotional and Sensory Overload yet. I had no idea how to help myself and her back to safety and calm. My husband and I were so exhausted we became snappy and unkind to each other, which caused a whole new string of unhelpful thoughts. Did we cause her to be unhappy? Was it our tension that prevented her from relaxing into sleep? Were we jinxing her ability to feel safe? Were we already destroying her life before she had even had her first birthday? What did I know about how we, the parents, are the context of our children and how we would be able to improve it? 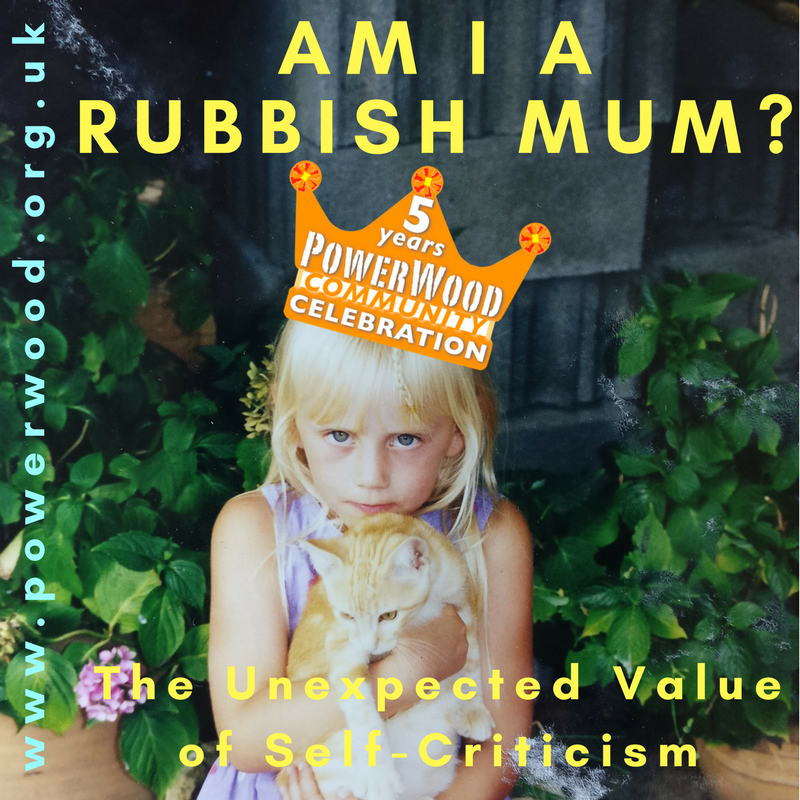 I was so knackered and stressed I wasn’t able to think properly anymore, nor was my husband, and I felt overwhelmed by negative feelings of guilt, shame, anger, pain, inner-conflict, frustration, and self-criticism. Every unhelpful thought was able to create a domino effect on all the previous recurrent negative thoughts creating an all-encompassingly bleak scenario. I only had to have one thought and it would recreate this bleak scenario time and time again. When I finally went to see the GP to explain my worries about my daughter not sleeping much and us feeling completely exhausted, she, after concluding our daughter was perfectly healthy, uttered the now famous words in our family: “You are just unlucky”. Yes indeed, we were not properly prepared for the reality of a child like ourselves! We had not been modelled parenting tools by our parents that we wanted to apply. We felt utterly alone, overwhelmed and out of our depth. People with overexcitability (OE) have a gap between who they are and their personality ideal. Most people don’t have this gap according to Dabrowski. Dabrowski thought that only one-third of people have this gap, according to him most people are just content with who they are. Having this gap creates a lot of negative emotions: shame, guilt, self-criticism, inner conflict, self-doubt etc. that we call the Gap Energy. Even though those negative emotions might feel uncomfortable or painful, and it might make us want to disappear, this Gap Energy is the only reason we have the drive to improve ourselves, improve the life of our children and sometimes even the deep wish to improve the world. At the time I didn’t know any better and unfortunately, I used all my unhelpful thoughts to ingrain this vivid bleak scenario, a future vision based on the equation of all those negative thoughts, even further in my neurological pathways. Later I learnt we can have the choice to either use this Gap Energy to create an unhelpful train of thought or use that energy for a tiny tiny step towards our personality ideal. So I was experiencing Gap Energy and could have used it to improve my Baseline (my energy level and emotional resilience – more on that next time!). Only 10% of what happens in our minds is conscious, 90% is in our subconscious. A choice is only possible when we are aware: we need to be conscious of anything we want to make a choice about. Without awareness (and acceptance) change is not possible. Imagine if you are the captain of a ship, and you are not aware of what’s going on in the rest of the ship. Someone might dig a hole in the cargo hold, or the engine room might be on the verge of exploding. How are you going to make sure that this ship is sailing towards your aims if everything below the little wheelhouse on the top deck is in your subconscious. It will be really hard to steer the ship towards your goals if there is so much going on in your ship that you are not aware of and you are unable to make a choice about. “I’m proud and grateful to be aware that I have/had an unhelpful (train of) thought about ……… (this has to be neutral, so it’s not focussing on what doesn’t work e.g. me not cleaning enough, becomes cleaning) and I’m going to do the 4-7-8 right now”. By complimenting ourselves about our own awareness (independent and not judgemental of the content or how we act) we can use any unhelpful thoughts (and our awareness of them) to grow our emotional resilience and increase our emotional credit with ourselves. For every five of these compliments, we give ourselves each day, we will be able to listen to and hear one comment, that could be taken as a criticism, and not take it personally. The Awareness Mantra will also help to close the gap between when the thought happened and when we become aware, as without awareness in the moment we cannot change our response. For the intellectual OE people amongst us: any thought we have for the second time is probably an unhelpful one. I have never met someone who tried consciously be less good than they were. Please do not forget we are all the very best person we can be in this very moment. Let’s embrace ourselves and all our efforts to grow awareness by complimenting ourselves with all the tiny tiny steps we make. When we do get distracted by our bleak scenarios, thoughts that are not real and not helpful in achieving our aims, we can use them to grow our Emotional Resilience by growing our Awareness. Never forget we are the best person we can be and that is good enough!